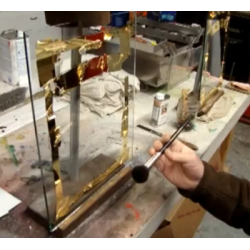 Video How-To below, A short How To video on using a Gilders Dusting Mop on Gold leaf. Advanced techniques are available through advanced workshops, and at Gilders and Letterhead Gatherings. Gilders Dusting Mops-Gold Leaf series Rp8Buy Gilders Dusting Mops for Gold Leaf series Rp8 Full Set for sale here, are used to gently Dust away the ex.. Rolled Cotton for Gilding Gold LeafBuy Rolled Cotton for Gilding Gold Leaf by Gilders Specialty Products for sale here. Gilding Cotton is used f..